Q: Does it comply with California state law requiring safe storage devices to be available in pharmacies? A. Yes. California law, Assembly Bill No. 2859, requires pharmacies that dispense Schedule II, III, or IV controlled substances to display and have available safe storage products. 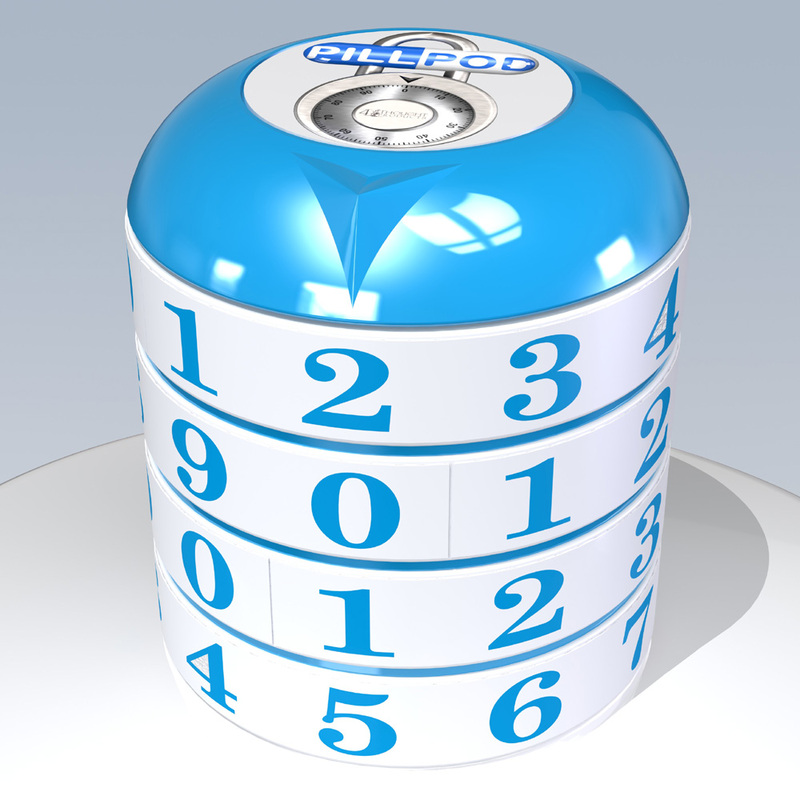 Pill Pod qualifies as a locking storage container that can be offered to meet this requirement. Q: Can’t it be broken into being plastic? Can’t the whole thing be stolen? How secure is it? A: Keep in mind that Pill Pod, Rx drug and marijuana lock box is a deterrent and not intended to be a high security safe. It is meant to restrict and keep others out of your meds & cannabis products and prevent problems from starting. It strikes the right balance in providing you with convenience of storing or moving it where you want. Anything can be broken into – including front or sliding glass doors, which typically have locks as well. It is “tamper evident” -meaning that anyone trying to break into it would need to use significant force and/or tools, destroying it in the process, and evident to anyone. If someone with an addiction is intent on stealing drugs, nothing, outside of a heavy-duty floor mounted steel safe, will prevent them from tearing out a drug lock box and breaking into it. 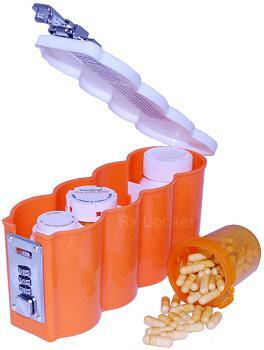 Q: What about other drug lock boxes and locking pill bottles being sold, how secure are those? A: Consumer Alert: A number of “locking” products being promoted, marketed, and sold have no security and should be avoided. Before you purchase anything, carefully read through the product reviews on Amazon or elsewhere. Know that some of the “glowing five star reviews” are fake – planted there by friends or insiders working for the manufacturer. !WARNING! THIS PRODUCT, SAFER LOCK, IS DANGEROUS. A CHILD CAN GAIN ACCESS WITHOUT ANY STRENGTH, TOOLS OR SPECIAL SKILLS. IT CAN NOT EVEN QUALIFY AS A DETERRENT. The first video below, created by another Rx lock box company, shows this serious product design defect. The second video beneath, made by a product reviewer, also shows the same defect. Safer Lock or The Locking Cap by Gatekeeper Innovation, Inc. is a facade, something posing to be secure, but is anything but safe or innovative. It is intended to be a locking pill bottle with a cap that has combination locking tumblers. As the videos below illustrate, regardless of the combination, it can easily be opened in its “locked” state by anyone – child or adult. The premise of the design is that in the “locked” condition, the cap will free spin, or be disengaged and not be able to be unscrewed from the bottle. Many consumers have also reported the defective design in Amazon product reviews. We ourselves have verified that if one just pushes down on the cap, with just a slight bit of pressure while unscrewing the cap counterclockwise, it will easily come right off. This is the identical operation one uses when opening a child-resistant safety cap -push down & rotate counter-clockwise. What is even worse is that pills can be stolen and the cap put back on – showing no signs of a break in or damage. The prescribed patient might never discover that their pills are being routinely stolen! Even if just pulled upon, the cap will pop right off from the bottle, as plastic bottle neck easily flexes/collapses and it can be put back on. This is a defective, ill-conceived, non-engineered, concept at its worst. The company continues to stand up in the cause to promote Rx drug prevention – in front of a product that secures nothing. They have also taken this flawed concept and placed it onto a plastic case to create yet another unsafe product -the Safer Lock Box. Same as the bottle, it can be broken into by anyone, without any strength, special skills, or use of tools. It can be closed again and function, showing no signs of tampering. These products are unsafe for anyone trying to secure medications. Good intentions do not outweigh a very unsafe and dangerous consumer product which should be recalled. Aluminum lock boxes with briefcase style latches produced by Lockmed and Vaultz, likewise have no security and can be opened in their “locked” state simply by pushing on the release button. Several videos on YouTube (see below) document just how flawed these products are. Their metal rugged appearance gives the false impression that these lock boxes are strong and secure. In actuality, anyone can easily pop open the latches in just seconds, steal some of the drugs inside, and then close it again. The theft can go on undetected, as the product will continue to function without any signs of tampering or a break in! Heavily promoted RxLocker, was recalled in 2012 after the U.S. Consumer Product Safety Commission. It had no security. Just rapping it on a table would cause the metal hasp to spring open. See video here. Any product intended to secure medications, where locking can easily be bypassed, drugs stolen, show no signs of tampering or damage, and still remain functional – is unsafe and a liability risk for consumers and should be avoided. Pill Pod was designed and developed in response to researching this product area and seeing a need for a more secure solution that could be made affordable to any family. Q: Why is there no reset feature for the combination? A: In development, we prototyped and tested several different design versions and consciously decided to forgo this option. First, it would have been more complicated for end users to have to follow instructions and do a set up procedure (everyone’s favorite thing to do). Second, and more importantly, we did not want to weaken or provide an opportunity to allow the security to be bypassed – which would have been the case with a resettable combination design. Q: Why does it have a rigid non- removable bridge that restricts access and limits the bottle sizes? A: The bridge with post and key tabs is fixed, rigid, and an integral design part of the container’s strength. We did not want the bar to either be removable or swivel, as that mechanically weakens the joint and potentially compromises its security. Q: Why are there limitations on the bottle sizes it can accept? A: Most typical prescriptions for meds come in 30 to 60 pill counts, although some chronic pain patients are prescribed higher – 90 or 120. The bottles used can vary and there is no set standard. It’s really at the pharmacist’s discretion in terms of what “vial” size they choose to dispense your prescription in. Sometimes you’ll get a small one. The next time, the same prescription might come in a larger vial – where the pills occupy just a small portion of the entire volume at the bottom. After listening to customer feedback, we changed the design of our container to include a cutaway on the sidewall so that it can now accept bottles up to 2-1/4” in diameter. We found that this allows a good majority most “typical” bottles to fit. You can always ask your pharmacist to dispense in smaller vials if available. Q: How secure is the locking mechanism, can’t the tumblers be easily picked? A: Maybe – if you are a locksmith. The product was designed by an engineer with a number of years in the lock industry. We added extra security features of pick resistant tumblers. Without knowledge of the combination, there is little chance for someone to bypass security, open and steal some of your pills, and then close it up again. Breaking in means destroying the product. Q: Why don’t the tumblers detent, or click, beneath the marker? A: We wanted to keep the friction and force to rotate the tumblers at a minimum – so that it would be easier to use for someone who might have arthritis or a similar condition. Q: I’ve lost or can’t remember my combination. Is there a default bypass code? A: We recommend that you to cut off the tab with the assigned unlocking code provided and keep it in a safe location that only you or another responsible person will have knowledge of. As part security, there is no backdoor way to get in, other than to break it. If you find yourself in this situation, needing to break in, the easiest way is to use a pair of pliers – twist and break off the blue retaining cap, above the tumblers, then remove the tumblers. Q: Is it big enough for insulin, syringes, and supplies? Can it be refrigerated? A: Yes, there should be sufficient space capacity for this purpose and it can be kept refrigerated. Q: How child-resistant is it? A: Generally vials, bottles, or blister packs, which medications are commonly packaged or dispensed in, need to meet child-resistant packaging testing standards per ISO 13127. Because medications are not directly dispensed in Pill Pod and because it is an auxiliary locking package, these standards do not directly apply to it. That being said, with its durable construction, for child or adult, it is not possible to easily, bypass its security and break in – without physically destroying it.